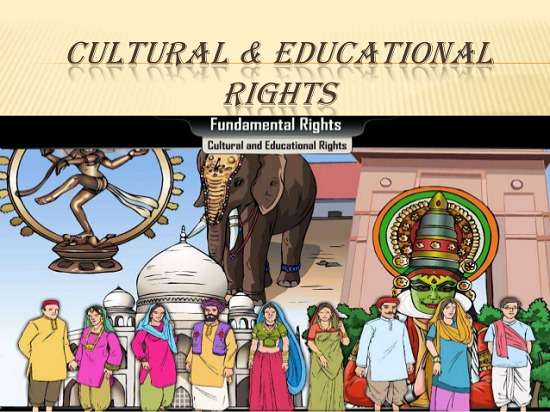 Cultural and Educational rights: Preserve the right of any section of citizens to conserve their culture, language or script, and right of minorities to establish and administer educational institutions of their choice. Article 29 and Article 30 of the Indian constitution provides for cultural and educational rights. Cultural rights would be those that allow you to practice your culture and heritage. It includes the right to freely practice and propagate your religion, or not to practice any religion, right to maintain monuments and heritage sites, right to educate the younger generations about their culture, to speak and teach your language etc. Availability – funded by governments, education is universal, free and compulsory. There should be proper infrastructure and facilities in place with adequate books and materials for students. Accessibility – all children should have equal access to school services regardless of gender, race, religion, ethnicity or socio-economic status. Acceptability – the quality of education provided should be free of discrimination, relevant and culturally appropriate for all students. Students should not be expected to conform to any specific religious or ideological views. Adaptability – educational programs should be flexible and able to adjust according to societal changes and the needs of the community.